I was emailing with a friend today and the subject of why Americans like baseball came up. He was not born in the States and doesn’t quite get baseball. That conversation gave me the opportunity to put into words some ideas of why I love baseball. And now that’s given me a topic for a blog post. Though I don’t think the quote is precisely right, there is a lot of truth in it. Every time I emerge from a tunnel in a ball park, I am taken back to those first few times I passed from the dark of the tunnel under Fenway Park into the bright sunshine and pleasant cacophony of the crowd. I get a rush each and every time and feel like I am 10 years old again. Moreover, being a Red Sox fan keeps me tied to my home state. It’s been roughly two decades since I lived in Boston, soon I will have lived more outside of Massachusetts than in it. But donning my Red Sox hat makes me feel a little like I can hop on the T to Quincy Market for some Pizzeria Regina any time I want. I also like baseball for some other, more intellectual reasons. One of the things I love most about baseball is the battle between pitcher and batter. This is the point of tension that the whole game turns on. What is the pitcher going to do? What kind of pitch will he throw? What about the runner on first? How will the batter respond? Will he let it go for a ball? Foul it off? Put it in to play? Another element of baseball I love is that it is a kind of a fractal. Stay with me here… You have the pitcher-batter tension point but that takes place within a whole at bat which is part of an inning, which is in a game, which is in a series. Each level has a similar repeating pattern: three strikes, three outs, nine innings, a best of three series. It’s not really a fractal but it is a kind of complex spontaneous order arising out of a set of simple rules, repeating each pitch, each at bat, each inning, each game, and each series. And yet despite repeating this pattern, each at bat, inning, etc., is unique and its own thing. There is something beautiful and satisfying in experiencing the infinite variety that arises while being constrained by a set of simple rules. There are many other reasons to enjoy baseball: the excitement of a HR; the beauty of a double play; the amazing skill of chasing down a fly ball in the outfield. And if you are at a live game, forget about it! The beauty of the ballpark is worth the ticket in itself. But one shouldn’t feel that they have to like baseball. It’s one particular form of beauty and enjoyment among the endless assortment of human activities and endeavors worth admiring and enjoying. Whether it is baseball or something else, the important thing is to revel in what you love. The author of this guest post is Christopher Robinson. Dr. Robinson is a professor at the Ringling College of Art + Design (FL). Baseball encourages a certain delusion present in all groups that breed fanatics: the belief in the best. This error is reasonable. We can, after all, count the times a player bats and the number of times they hit and compute a simple “batting average” and then objectively rank players. It makes sense to conclude that including more traits will continue to produce objective rankings. This, however, is a fallacy. While including multiple traits may get us better rankings, they typically produce multiple valid rankings. For this post, I will focus on a single sport: baseball. I will present what we can call the Top 10 Principle: While there are better or worse Top 10 lists, there can be no authoritative ranking of baseball’s best players. Indeed, when we rank entities along more than one dimension, we will often be able to produce more than one valid ranking. As we construct our list of 10 Men, there are certain names that are obvious candidates, such as Babe Ruth or Jackie Robinson. As we refine our lists, we will have to move beyond “a player’s hitting skills matter” to quantifying what it means to be a good batter; we won’t just say someone is good, we will count the number of hits or home runs. We will also judge each player by position specific statistics, including catches, throws, or ERA. We will break players down into statistics and then select specific players with the best mix of statistics. A Top 10 based on the number of home runs would differ from one based on batting average; one based on stolen bases differs from one based on fielding percentage; each attempt to combine traits would produce a different Top 10 list. Indeed, this is a general rule: when we rank entities on more than one trait, we will produce more than one valid ranking of entities. It is quite common to phrase ethical choices as “either/or,” as absolutism or relativism, as if something had to be universally, necessarily, and certainly good or it was no good at all. In this case, people might argue that there must be one authoritative Top 10 list or any list is valid. This is a false alternative. Even if there is not a single authoritative ranking, some rankings will be better than others. A Top 10 list based on the number of home runs would be more valid than one based on who happened to play in the first game I saw as a child. In a similar way, while I cannot say with certainty who will be in someone’s list of Top 10, I can reasonably predict that it will not be Ray Chapman or Fred Merkle. The world is full of uncertainties, such as whether Babe Ruth called his shot or whether Pete Rose or Mark McGuire will ever be elected to the Hall of Fame, but some explanations and predictions are more reasonable than others. In life, as in sports, we are constantly ranking entities, ranking options, ranking people, ranking ideas along multiple value dimensions. Not only will there not be an authoritative list of values, but different values will often conflict. A good pitcher will not usually be a good batter. We value clean air and water, but we also value economic growth; we value novelty and stability; we value justice but we also value mercy. When we value all these things, it is impossible to arrive at a single authoritative ranking of people, economic policies, countries, or religions that embody those values. We should expect some conflict and tension as we determine what solutions resolve the various conflicts between values. It is a measure of how far we have come that owners conspiring to keep blacks out of baseball is as offensive as people used to think it was justified. While there are some universal truths, they appear to be more in mathematics than in ethics. In ranking values in the world, some lists are more reasonable than others, even if there is no authoritative ranking. With this, we are aware that there are many possible Top 10 lists, and this encourages us to ask, “How should one determine a Top 10 list,” before we pick 10 people and then justify those choices. By discussing the reasons for their decisions, people can have a more reasonable discussion and disagree without ill will. The “Top 10 problem” encourages people to think about the reasonableness of the reasons one gives, and whether one would accept those reasons from other people. It also encourages us to see our limitations, such as in an implicit bias among people to ignore players like Satchel Paige who didn’t play in the white major leagues during his prime years. Any Top 10 list will contain choices based on objective data, personal preference, and one’s sense of how to integrate the relevant variables. While there’s not one objectively correct one, it is worth taking the effort to understand the principles involved in selecting one’s top choices. The next episode of The Sports Ethicist Show airs Monday, March 3, 2014 at 6 pm CT on Rockford College Radio. Rules are an essential part of sport. They define it, they govern it. But what about changing the rules? Three recent rule changes have gained national attention recently: expanded MLB replay, limiting home plate collisions in MLB, and penalizing the use of the ‘N’ word in the NFL. Shawn Klein and frequent guest, Mike Perry, discuss these rule changes and whether they are good ideas or not. 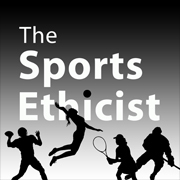 The Sports Ethicist Show airs tonight (Monday 11/18/13) at 6 pm CDT on Rockford College Radio.